The first day of my fiction workshop at George Mason University this semester got me thinking about the pressures to “finish” a piece of writing, and a new book I’ve just been delving into, Raymond Queneau’s Exercises in Style, along with an old anecdote about sculptor Alberto Giacometti, helped offer some different perspectives on the process. I’ve written elsewhere before—in other blog posts and interviews (so excuse me if you’ve heard it)—about a lesson I took from the work of sculptor Alberto Giacometti and specifically his Women of Venice series. 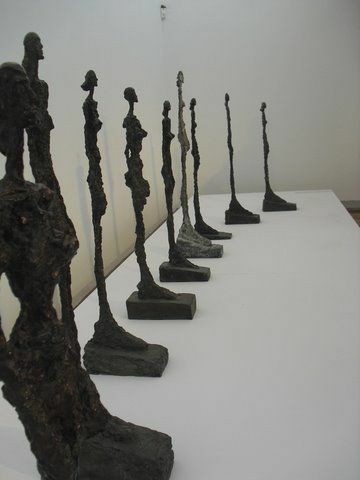 Back when I worked at the North Carolina Museum of Art, we hosted an exhibition that included one of the sculptures (the series as a whole is pictured to the left), and I was fascinated not just by the artwork itself, the texture of it, the existential starkness of it, but also by the story of how Giacometti created the series. As I understood it, all of them were cast from the same mass of clay, clay which Giacometti worked and shaped and reworked and shaped until eventually it reached a form that he found suitable, at which point he called his brother in to make a cast of the “finished” product. And then he began working and shaping that same clay again.